With Halloween just a few weeks away, I thought it was a good time to have a recycled project review of the different craft items that I have done over the years for Halloween. 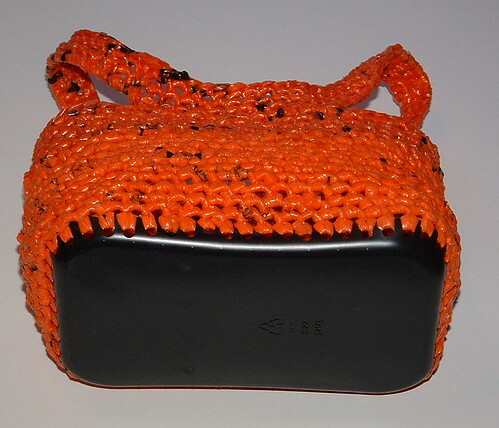 Here is a trick or treat bag I crocheted using recycled plastic orange newspaper sacks. I used a gallon milk jug bottom for the base of the inside of the pumpkin to give it a sturdy base. Here is the link to the complete plarn pumpkin trick or trick bag pattern. 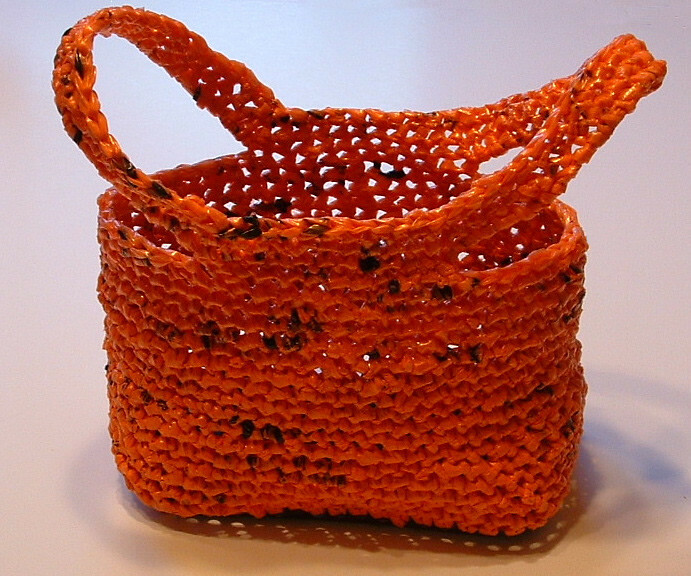 Using these orange plastic bags to create a trick or treat bag was a great way to recycle my newspaper bags. Here is my picture tutorial for cutting the newspaper bags to create plarn so you can crochet with the material. For this project, I wanted to create large comfortable handles that could be put over a child’s arms for easy carrying of this basket type bag. I recycled a microwave dinner tray and cut the top rim off. 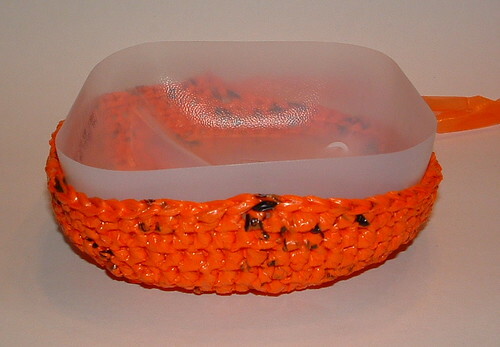 I then hole punched around the base evenly so I could crochet into the plastic tray for the base of this bag. The dinner tray provides a flat and sturdy bottom to the bag which allows the bag to stand up nicely on its own. Enjoy crocheting this recycled bag project and happy Halloween everyone! 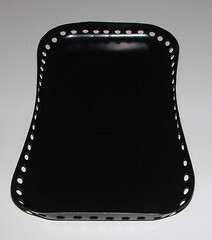 Using the tray after cutting off the rim, punch holes around the base as shown in the photo. I used a heavy duty hole punch to put the holes around the base. 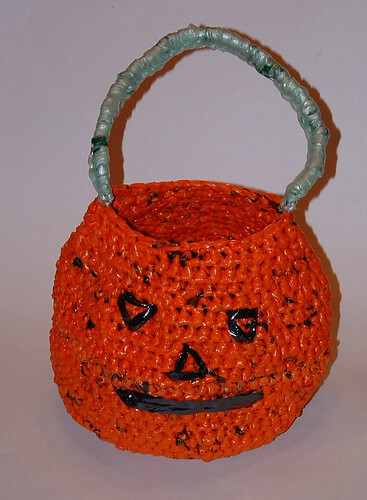 Here is one more recycled Halloween craft project. It uses a yogurt cup and yarn to create a cute party favor. This is a perfect kid’s craft project as they can decorate the cup for Halloween. I cut construction paper eyes and a mouth to decorate my treat cup. Let your kid’s have fun with this and decorate the cups using yarn and different colored construction paper. 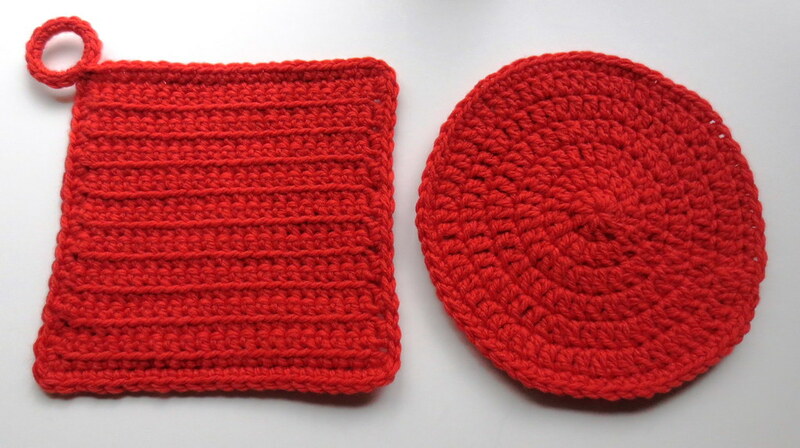 I used regular yarn to crochet this cup holder and the free pattern is found below. If you’d like to use vcr tape with yarn, here is that free pattern link.